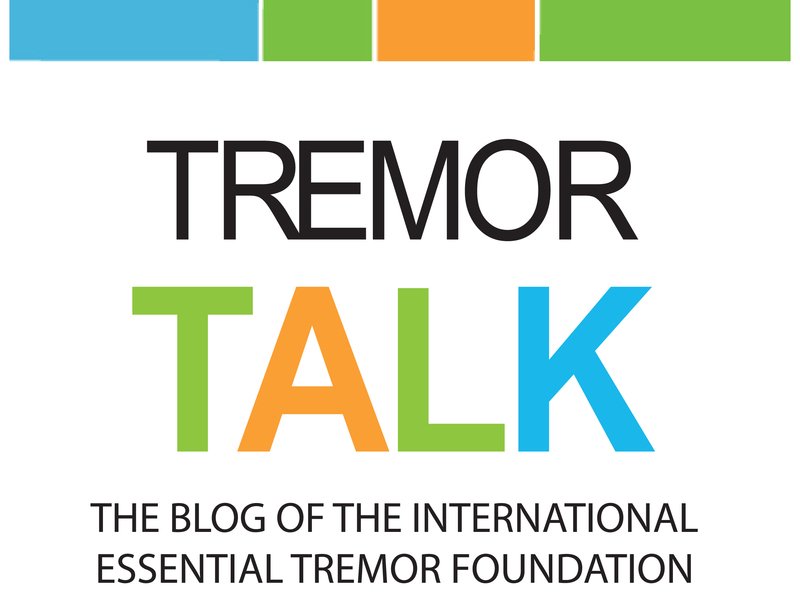 March is National Essential Tremor Awareness Month is a time to shine a light on essential tremor and the impact it has on millions of people throughout the world. 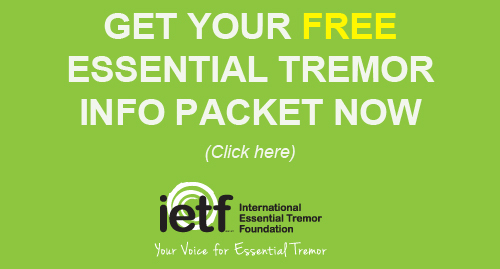 Join the International Essential Tremor Foundation (IETF) each March, as we host a special campaign to raise awareness so there is a greater understanding and acceptance of essential tremor. Essential tremor (ET) is a neurological condition that mostly causes a rhythmic trembling of the hands while performing a task such as eating, writing, dressing, drinking or when holding a posture such as with the arms outstretched in front of the body. The tremor can also affect the head, voice, legs and trunk. Hold a DIY fundraiser and designate the funds raised to go to IETF programs that help raise awareness. Be creative and have fun … all for a good cause. Let us know about your event by completing this form. Check out this handy DIY guidebook. Order free awareness posters and post them in areas that get a lot of foot traffic, such as grocery stores, pharmacies, your doctor’s office, community or senior centers, local libraries, etc. You can make an awareness donation anytime through our website. Share IETF social media posts and pages from the IETF website on your social media channels. Helping to educate your friends and family is as easy as clicking “share”. Use our digital downloads (below) to show your support for the IETF and ET awareness on your emails, posts, and tweets. library or other public place. Facebook Cover Image – Raise awareness to essential tremor through this Facebook banner. followers know about essential tremor. 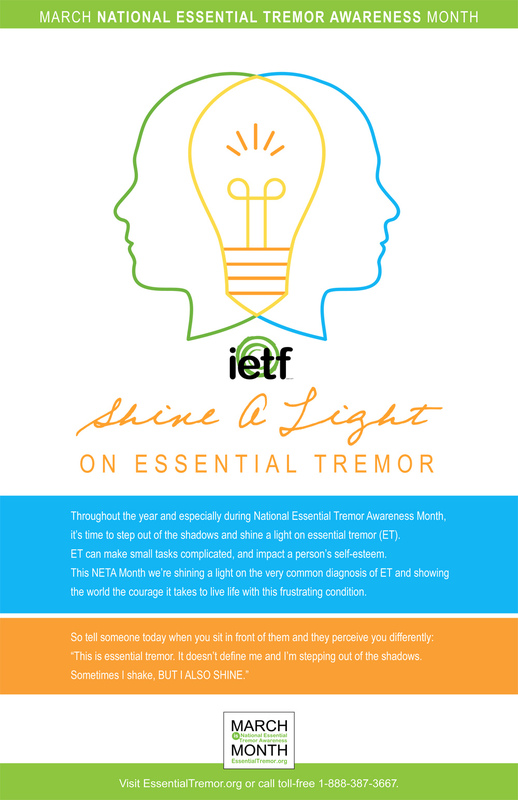 NETA Month Logo – Upload this National Essential Tremor Awareness Month logo and help promote ET awareness during March. One of the easiest ways to help raise awareness is to support all the awareness-related programs and services the IETF provides. Your donation goes right back into awareness efforts happening throughout the year and for next year’s big national awareness month campaign, so please give generously. 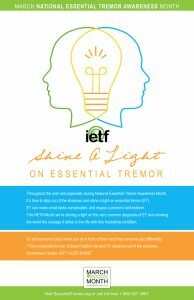 The IETF worked very hard to have March designated as National Essential Tremor Awareness Month. Here’s how we did it. 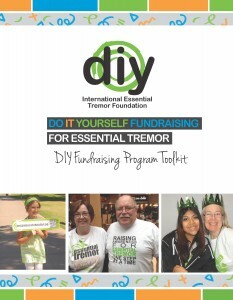 Do It Yourself Fundraising is an opportunity for those with a deep commitment to the essential tremor cause to raise awareness and funds for the International Essential Tremor Foundation’s mission in new and creative ways. For those who have reached out to state or local governments, to have them declare March to be National Essential Tremor Awareness Month, you are welcome to use the wording from the original House of Representatives Resolution. Don’t know how to find the contact information for your federal, state, and local government officials? Here’s a convenient link.